A medieval Andalusian polymath famous for his translations and commentaries of Aristotle. A visual art related to writing—the design and execution of lettering with a broad tip instrument or brush in one stroke. A form of artistic decoration consisting of surface decorations based on rhythmic linear patterns of scrolling and interlacing foliage, tendrils, and other elements. Painting of the Ali Baba story in The Book of One Thousand and One Nights by Maxfield Parrish. 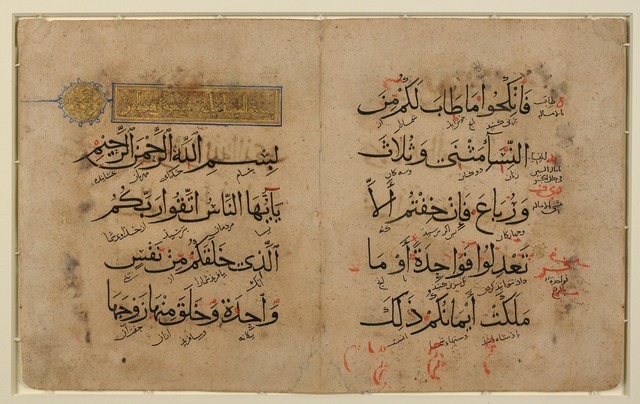 The introduction of paper in the 10th century enabled Islamic scholars to easily write manuscripts, including The Book of One Thousand and One Nights. Arab scholars also saved classic works of antiquity by translating them into various languages. 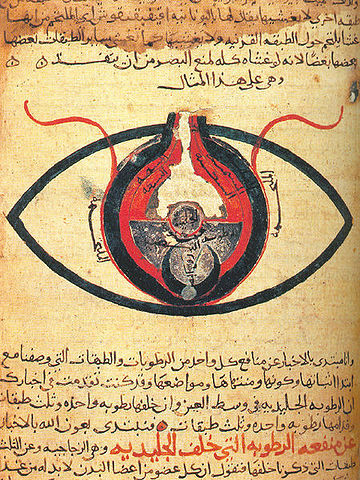 The eye, according to Hunain ibn Ishaq. Scholars developed large encyclopedias of medical knowledge during the Islamic Golden Age, such as this one from a manuscript dated circa 1200. 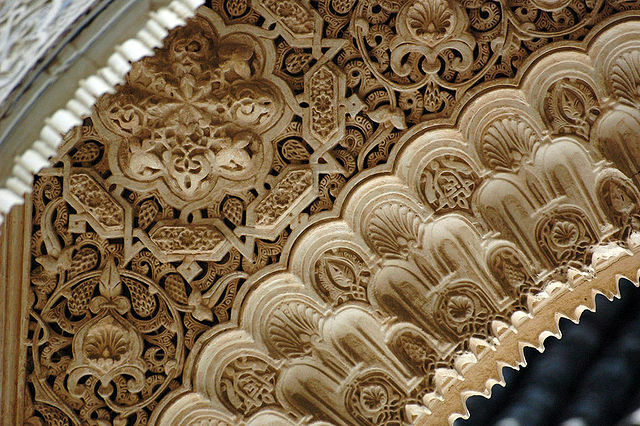 Detail of arabesque decoration at the Alhambra in Spain. Arabesque in Islamic art is often used to symbolize the transcendent, indivisible, and infinite nature of God. Hamdanid gold dinar. 10th-century Syria. Mosque Archway. Geometric patterns: an archway in the Sultan’s lodge in the Ottoman Green Mosque in Bursa, Turkey (1424), its girih strapwork forming 10-point stars and pentagons.